Mariglen is at present seven years old. He is doing well and is in good health. Mariglen lives in Urake, this village is about forty minutes far from our feeding programme centre. Mariglen attends the second grade at school in his village and after he finishes school for the day, he comes to attend our programme. The subject he likes to study the most in school is Language. He and his friends all walk together to attend. Mariglen uses his free time to play football. His future dream is to be a driver and his favorite color is red. Mariglen attends twice a week, every Tuesday and Friday our feeding programme at Kotodesh, enjoying the combined meals cooked and served to the participating children. He likes the fried chicken, sausages, pasta and rice served by our cooks. Mariglen attends the Bible classes for the children who are same age with him and enjoys singing to praise the Lord Jesus and learning from God’s Word. At the end of the Bible lesson, he and the other children spend time to play at our feeding centre under the care of our teachers. Mariglen has a sister who is at present two years old. Mariglen’s father is emigrating in Greece a few times every year so he can provide for his family by working there. 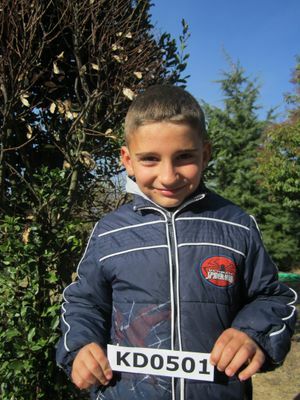 He works there in agriculture or collects and cultivates olives, earning this way a good average amount which means a lot to a family who lives in Albania. He is being missed at home while he works abroad. This is the challenge that he and the children need to face with. Mariglen’s mother stays at home to do the housekeeping and to care for him. The people in the village of Urake make the living by working in the lands or raising animals. They usually plant wheat, beans and other vegetables to have food provision. The families usually will keep a cow or a few goats as well as chickens.